NEW YORK (CBSNewYork) – The Occupy Wall Street protests have gone global, so it should come as no surprise that it has gone viral as well. The Internet being what it is, as soon as the movement gathered some attention, a variety of memes, jokes and viral videos surfaced. Most of the videos gathering attention involve clashes between protesters and police, but nonetheless some others have broken through. One involves a man asking a woman to “Occupy my life,” giving her a ring and getting engaged amid the protesters. Greenstreet acknowledges the film and Tumblr account are controversial. Naturally, there’s also a “hot or not” style slideshow of shirtless guys at the protest as well. 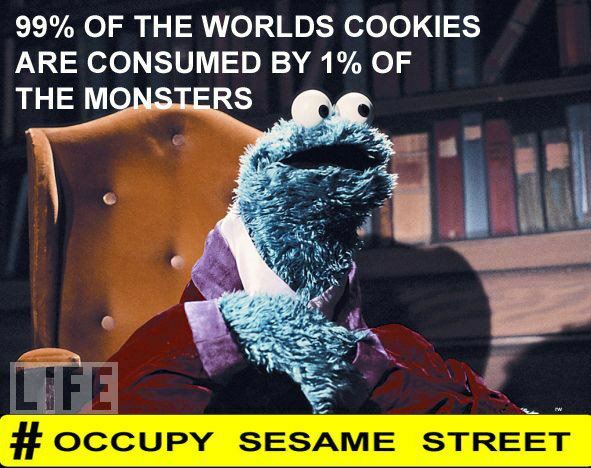 The Occupy Wall Street demonstration also inspired a satiric spin-off: Occupy Sesame Street. And there’s also the Octopi Wall Street meme cooking as well. And as with just about anything in the Internet age, from the Bronx Zoo Cobra to Double Rainbows to Charlie Sheen, there’s been an explosion of merchandise available online inspired to the Occupy Wall Street demonstration: Coffee cups, thongs, hoodies, aprons, teddy bears, t-shirts for dogs – you name it. And, as you might expect, where there is a message supporting a cause, you can find a message opposing it. The same is true with the online merchandise, with some coffee cups emblazoned with slogans opposing the demonstration. Has the Occupy Wall Street movement “jumped the shark” or is it just getting going? Sound off in our comments section.